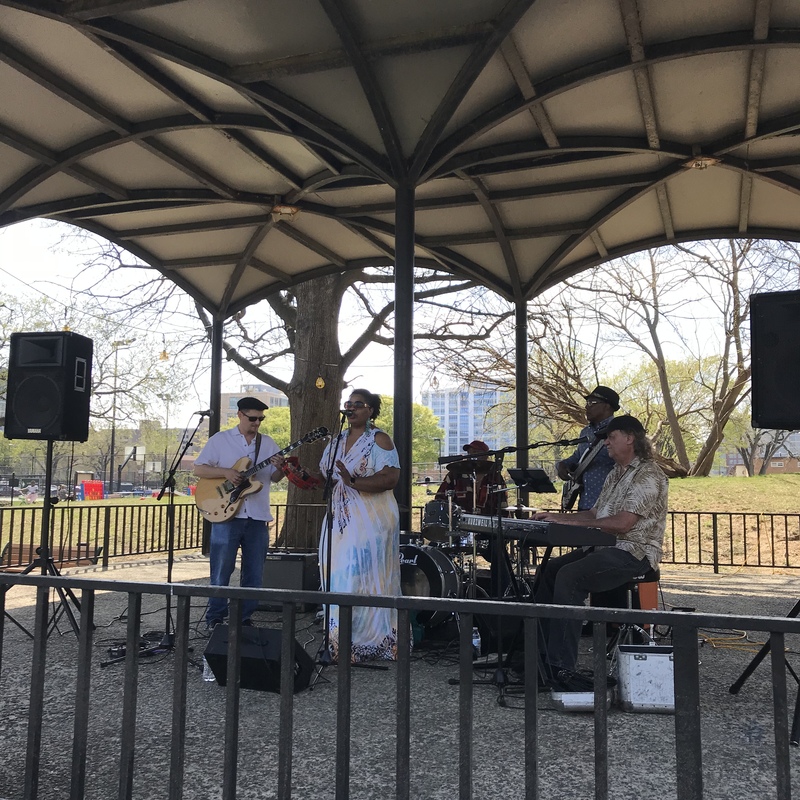 Southwest DC showed up, and showed out for our 5th annual spring kick-off, and first ever SW Earth, Arts, and Music Day! The day started with volunteers coming into the garden to help weed, plant, and paint. Weeding needed to be done along our food fence area, a space we designed for passersby to enjoy blackberries, rosemary, and lavender, and amongst the garden beds. While some volunteers weeded, others planted a variety of crops: lettuce, arugula, spinach, radishes, carrots, peas, peanuts, and beets. For those that weren’t ready to get their hands dirty with soil, they could choose to get them dirty with paint! Volunteers painted garden related signs, and helped with our new garden mural, designed by artist, Eric B. Ricks (Instagram: versatilevice). The mural is a must-see. The artist naturally includes geometric shapes and nature in his artwork, and the garden mural is no different. There’s a subtle homage to SW as well, but you’ll have to visit it and find it for yourself. Ricks implemented a paint-by-the-numbers approach which invited collaboration, and was accessible to participants of all ages and skill levels. The mural serves as a welcome to not only the garden, but to Lansburgh Park in general. As 1pm approached, weeds had been pulled, seeds had been planted, and paint had been used to artistic ends. It was time for a little reprieve. 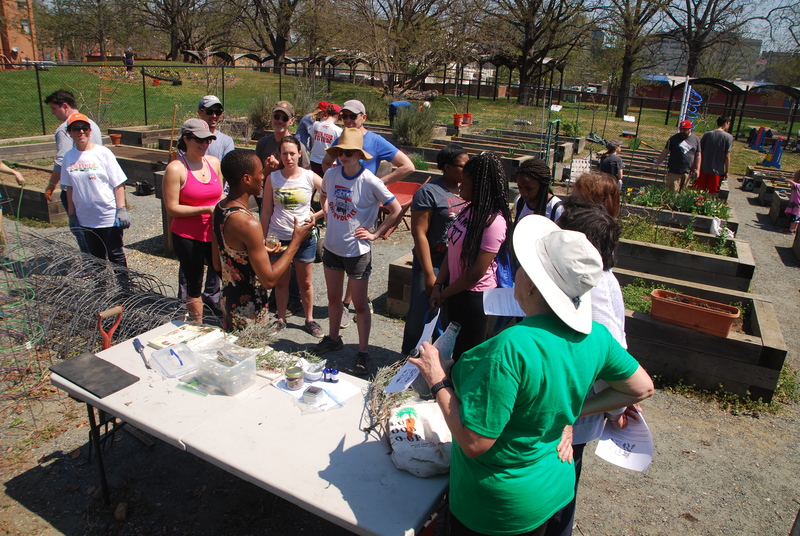 Violent King, an herbalist, who works with the non-profit, food justice oriented organization, and fellow garden-neighbor, Dreaming Out Loud, lead a mini-workshop on herbs, how to use them, and their many medicinal benefits. It was then time for lunch. Sweetgreen donated half-salads, and Cava donated pita chips, breads, and dips. 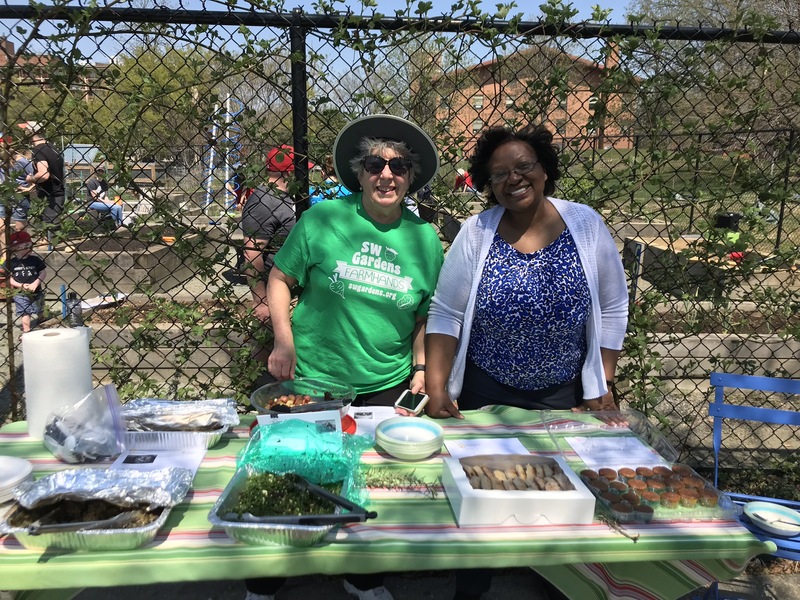 Additionally, fellow SW neighbors, Kate and Debbie, contributed a variety of healthy food options, and spoke with people about their simple recipes. 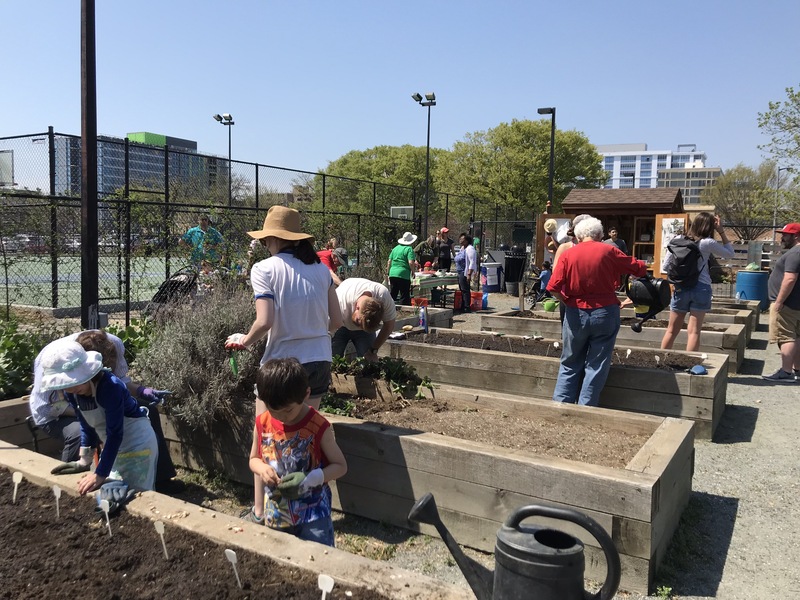 As 3pm rolled around, an untold amount of weeds had been pulled, several hundred seeds had been planted, and the mural was nearing completion. It was now time for the music! The music was delivered via the soulful, bluesy vocals of Carly Harvey, with ample support from her band, Kiss & Ride, and fiancee, Sol Roots. The band played an hour long show of original songs and covers, ranging from a bluesy version of, “Crazy,” to Amy Winehouse’s “Valerie,” all the while keeping a steady groove, and listeners deep in the pocket. All in all, it was a great beginning to the gardening year. It’s a beautiful thing when the community comes together, and this event was a testament to that. We had nearly 100 volunteers. This event would not have been possible without the work of our initial crew of 14 volunteers, as well as the lead volunteers, the generous donations from restaurants and businesses, the Southwest Business Improvement District for funding, equipment, organizing, and staffing, the Southwest Neighborhood Assembly for co-sponsoring the event, Mercy Hill Church for always being supportive, and the brilliance of artists, Eric Ricks, Carly Harvey, Sol Roots, and the whole Kiss & Ride band. Now, that we’ve kicked things off, our regular work days will commence. You can join us in the garden every Wednesday 6-7pm, and Sunday 4-6pm until late October. Feel free to reach out to us via email, swgardensdc@gmail.com, or any of our social media profiles. Hope to see you in the garden!